2…c6 Anand chooses the Slav again. 4. Nc3 Kramnik chooses not to play the exchange Slav as he did in game 1. We can assume he did not reach the desired position in game 1 and is now willing to take his chances to see what Anand’s preparations have sprouted. 6. Be3 Kramnik chooses the Meran set up. 8…a6 Anand shows he is ready to play tactical chess. Students can easily find thousands of great games played from this position. 14…Bb7 Another novelty from Anand’s preparation. In previous games the bishop is placed on a6 to defend the pawn on b5. Anand chooses to use his bishop for offense instead. 15…Bd6 Anand places his other bishop on the adjacent diagonal. Both bishops are aiming at Kramnik’scastled king. This feature, together with the semi-open “g” file are ingredients for a devastating attack on Kramnik’s king. 18. Bf4 Kramnik does not wish to leave his king defenseless by playing 18.Nd2. Perhaps he feared the possibility of Anand playing 18…Ke7 clearing the 8’th rank so that his a8 rook can move to g8. This is a pretty radical idea that I am sure we will see in a future game between top level players. 19. Nxf4 Kramnik refuses to play passively and sacrifices a ppiece himself. Had Kramnik played 19.Rxd4 then Anandwould have replied with 19…Kf8! 20.Bxd7 Rd8 21.Rad1 Rxd7 22.Rxd7 Bxg3 23.hxg3 Rxg3+ 24.Kh2 Bxf3 25.Qe3 Rg2+ 26.Kh3 Qxe3 27.fxe3 Rxb2 and black’s position looks good. 22. Qd3 Kramnik makes another strong move and proves the worthiness of his sacrifice. 24…Rd8 Anand makes a world class move and puts his rook exactly where it needs to be. 25. Qe2 This is where Kramnik’s game starts to go sour. Better was 25.Qb3 Kh8 26.Rc1! 25…Kh6 Anand is playing amazing chess. His king will be perfectly safe on h6 for the remainder of the game. 27. a4 Kramnik plays an interesting move here. To be honest, it will take more time on my part to determine if this is a mistake or not. 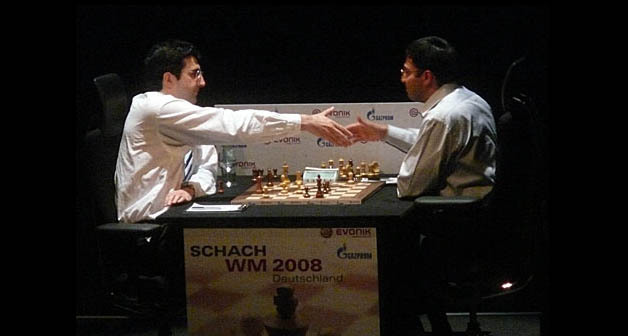 I wonder what Kramnik thinks of this move now. 29. Ra3 This is definitely a mistake. Kramnik needed to play 29.Rd1 Rg1+ 30.Kd2 Rg2. 32. f3 I believe Rd3 was preferable. 33. Bd3 This move will give Kramnik nightmares for years. Had Kramnik played 33.Kb3 Rc1 34.a5 he would have been a lot better off. 33…Bh3 All of a sudden the World Champions are playing like patzers. I have a hunch that 33…Bxd3 34.Rxd3 Qc4 35. Rc3 Qxe2 is better. In fact after winning the queen Anand has mate in 12. Even with missing the pretty finish, Anand has a win in the bag. This entry was posted on October 18, 2008 at 7:53 am and is filed under 2008 world chess championship, Anand vs. Kramnik, World Chess News. You can follow any responses to this entry through the RSS 2.0 feed. You can leave a response, or trackback from your own site.